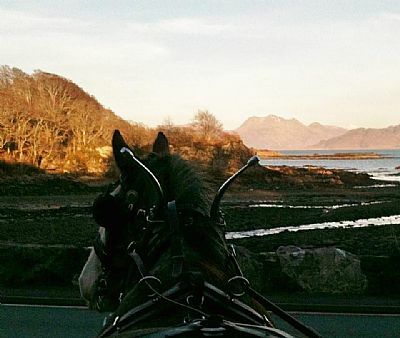 We run "Hop-on" trips leaving from The Clan Donald, Armadale throughout the summer.Come and join us as we head out for a fun-filled meander where you can admire spectacular views out to sea, looking across to Knoydart and Mallaig. These trips are available,weather permitting over the summer months. Information about Ride times and days will be updated here and on our facebook page. 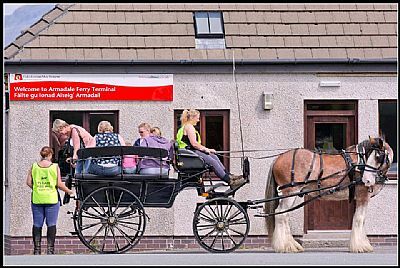 If you would rather be taken somewhere different or have the carriage to yourselves as a family outing, romantic trip, birthday celebration or even a wedding proposal we are available for private-hire all year round,subject to prior booking. We aim to be as flexible as possible about our bookings so if you have anything specific in mind we will try our very best to accomodate your wishes and make it as unique and memorable as possible. 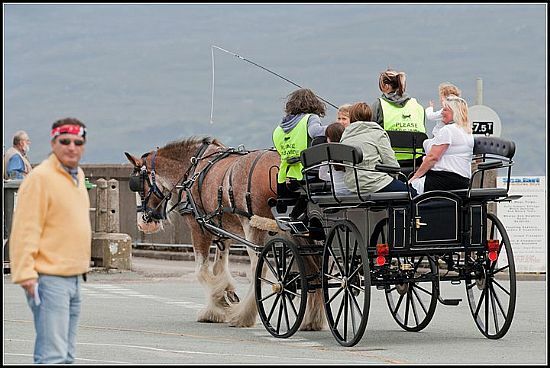 We are slightly limited to routes that we can take you on as some roads here are very steep/rough underfoot and therefore unsuitable for the horse and carriage though rest assured, if we can get you there we will! Bookings are flexible in duration up to a maximum of 2 hours (including breaks).